Giles County has 3 elementary schools, which matriculate into our two high schools. Macy McClaugherty Elementary Middle School and Eastern Elementary Middle School feed into Giles High School, while students from Narrows Elementary Middle School go on to attend Narrows High School. Our elementary/middle schools house preschoolers through seventh graders and offer students many opportunities for both academic and personal growth. Each school has wireless routers newly installed in all buildings and two mobile labs of Chromebooks, along with stationary computer labs, Smartboards in most rooms, and numerous Elmo document cameras to assist instruction. The Guidance Counselors operate a Character Counts program which teaches respect, responsibility, caring, fairness, trustworthiness, and citizenship. Our middle school students even have the opportunity to serve their school and community through various service projects. 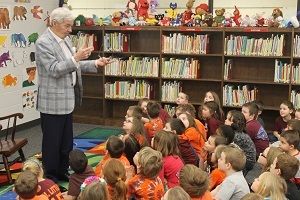 Shown here are students at Eastern Elementary hearing a story read by Frank Beamer, former Virginia Tech football head coach. Each school in Giles County has a School Resource Officer who teaches cyber-awareness, internet safety and brings in police personnel to teach the DARE program (Drug and Alcohol Abuse Resistance Education). Eastern Elementary is even designated a Blue Ribbon school for their efforts to reduce drug and alcohol abuse. The Virginia Cooperative Extension teaches nutrition classes throughout each year to instruct students in healthy eating habits. The Title 1 programs assists children struggling in reading and math and hosts Parent Reading nights during the year, along with Grade Level Reading Nights hosted by classroom teachers. Giles even has a county STEM Coordinator (Science, Technology, Engineering, and Math) who collaborates with teachers to incorporate STEM principles into their lessons and coordinates a county-wide Stemposium each spring with 24 hands-on exhibits along with offering a STEM summer camp for Giles students. Each school continues the STEM instruction with after-school STEM programs through a Department of Transportation grant and Robotics classes weekly. 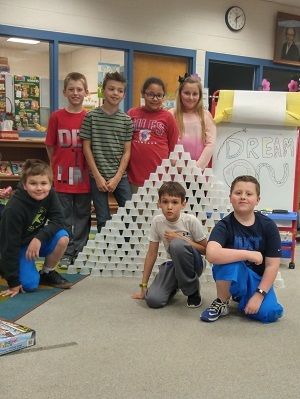 Students are getting creative with the cup-stacking station in the Macy Library Makerspace. Every school has a well-stocked library staffed by a certified librarian, who also operates a Makerspace for students to explore and create with both low and high-tech materials. Current activities include cup-stacking, legos, Makey-Makeys, LittleBits circuitry, origami, coding, science experiments, coloring, bracelet-making, and much more. Local best-selling author Tom Angleberger visits our schools each year to encourage students to continue reading and writing. Our gym teachers see every student for 30 minutes daily for a variety of physical activities: volleyball, badminton and archery are just a few of the offerings. The Narrows Archery team even competed in the VA State Archery Competition in Doswell, VA. Macy’s gym boasts a climbing wall for students to tackle. Many of our students also participate in after-school sports offered by the local recreation departments in our towns. Many field trips to area attractions like the Blacksburg Children’s Museum, Virginia Tech’s Kindergarten to College Program, The Science Museum of Southwestern Virginia in Roanoke, pumpkin patches, Radford University’s Planetarium and Selu Conservancy, both traveling and in-house shows by the Barter Theatre, and a three-day/two night trip to Washington, DC for our seventh graders help give our students a broader view of the world around us and an appreciation for local culture and natural resources. Here are NEMS students preparing for archery competition. Not only are students afforded these many opportunities for extracurricular activities and school-day fun, but our teachers stress academics and hard work. 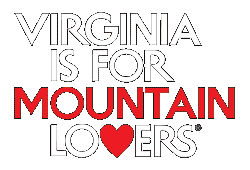 This kind of mind-set has led to all our elementary schools being fully accredited by the Virginia Department of Education. Students, staff and parents work together to ensure that Giles County students have many opportunities to grow and thrive in our elementary/middle schools. Don’t forget this month is National Teacher Appreciation Month. Many local Giles businesses are offerings deals, discounts, & specials to say ‘Thank You’ to our educators.